Meanwhile, Rick (Memel) is a former soldier who just wants to escape his violent past and find peace. He lives with his wife on a tranquil rice farm and that's where he wants to stay. Unfortunately, when Rick's wife meets her end at the hands of Sanchez's comrades during yet another violent flare-up in the country, Rick and his stonewashed denim jacket vow revenge. Rick and Sarah team up (despite some reluctance at first, naturally) to defeat the Sanchez gang because they both have their own reasons for doing so. But will they ever achieve their sought-after savage justice? Sure, the movie is dumb and low-budget-looking, and it has all the silly blow-ups, laughable dubbing, and machine gun shooting you would expect, but what did you honestly think this would be? But it's not all brainless pap (just about 99%), because the movie takes an unexpected left turn when Sarah and Rick go to a Shaolin temple to pick up some monks to help them on their revenge mission. Seems like the obvious thing to do. They want the whole temple, but the Master says "you may pick five". It's not explained why. Then Sarah, Rick and the five monks enter an abandoned city with spray paint everywhere. It is run by the midget Aldo (Hero Bautista), who resembles a carnival barker. The town is populated by children in strange, half-heartedly applied face paint. Think Gymkata's "Town of the Crazies" meets an Italian post-apocalyptic film. Strange indeed. Naturally it all comes to a head with the final showdown in the time-tested abandoned warehouse. 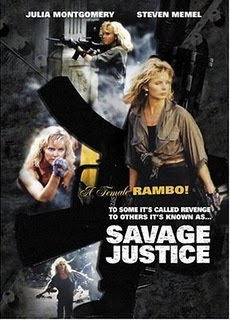 Despite the fact that Willie Williams is on hand, and Julia Montgomery is reasonably attractive, and the mastermind behind it all is legendary Australian producer Antony Ginnane, the truth is that Savage Justice's run-of-the-mill stupidity is an obstacle it never really overcame.